While in years past, many employers did not require database administrator employees to have a formal degree, recent technological trends have upped the game. In order to be appealing to potential employers you will definitely want to obtain your bachelor's degree in database administration. After completing your general education course work, you will want to focus your studies in an area such as mathematics, management information systems, statistics, computer engineering, computer programming, computer science, business administration, or information science. This will allow you to emphasize your studies in an area that will provide you with the technical knowledge, the educational knowledge, and the practical application that you will need on the job. This will allow you to manage the administration of simple and complex database systems. While this bachelor's degree program will take you approximately four years to complete, if you already have previously completed course work that is in a similar field then you may be able to complete your database administration bachelor's degree sooner. Similarly, some schools offer a two year program in this field of study. Should you choose to pursue this degree program, there may not be as many employment opportunities as there will be with a bachelor's degree. Once you begin working as a database administrator, you will likely spend the majority of your time working within an office setting. Depending upon your employer, you may also be required to be on call in the event of system failures of database emergencies. If the company you work for has multiple locations, you may be expected to travel between the locations to perform necessary duties or maintenance. On any given day as a database administrator, you will be handling the storage, the organization, the presentation of, and the use of database management software. You may also be required to analyze the information that is gathered by the database software. Typically, the duties a database administrator is responsible for will depend on their employer. For instance, you may be asked to identify ways to more efficiently handle the storage of company's information or to convert the company's database to a more updated version that will better address the needs. You will also be required to consistently perform tests and modifications to verify that a company's database is functioning properly. When database problems arise, it is up to the database administrator to fix the problem as quickly and efficiently as possible. - Work with departments to ensure proper data is used and maintained for accuracy. - Work with IT departments on security measures to keep data and ecommerce sites safe. We recently compiled a list of all of the tasks that you would be responsible for it you decided to get a job being a database administrator. Employees – Most of your day will be spend with other employees helping them with issues such as: connection issues, log-in problems and trouble shooting. It is often thought that DBA’s spend their entire time sitting behind a desk but the truth is you’ll be all over the office helping others with problems. Backup/Security – One task you’ll be doing a lot of is backing up the data that you work with. Often since so many people have access to the databases, and the ability to delete things, it is recommended that you conduct daily back-ups. Also security is a big issue both internal and externally. You want to ensure that the individual within your company have access to the data but can’t export it to a 3rd party. Testing – As a database administrator a lot of testing takes place. The testing can include disaster recovery drills or data loss testing. Since many companies can only survive based on the data they have and work with daily you’ll need to make sure that data is available if something serious will happen. Not all DA’s will be responsible for security measures as that is usually left up to others in the IT department but you will need to work with them on a daily basis to make sure the data is safe. Meetings – Your day wouldn’t be complete if we didn’t talk about meetings. Any company you work for will have meetings set up for you to attend. In these meetings you’ll typically listen to management or other departments going over what they need for a project and how you can help. Meetings are probably the most boring part of a database administrator’s job. Future Growth – One of the most important things I think all database administrators should know and strive for is to constantly be learning new things. When you graduate with your Bachelor’s Degree in Database Administration you should consider that a good starting point but always be looking for additional courses and even degrees to further your career. 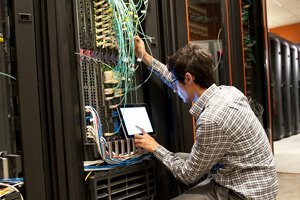 You might learn that being a DBA is a great position but always wanted to take the jump into computer science or computer programming. The skills you learned during your BA computer degree will help you learn another areas of IT is a shorter amount of time. Most of the credits you earned (if you want to an accredited school) should transfer over to a new school if you want to earn another degree.